These startups are proof positive that there's money in customized products. Three years ago, twenty-somethings Peter Crawfurd and Michael Yang were would-be web entrepreneurs in search of a business idea. Their top criteria: something they could start with limited funds, and something with big potential to scale. Avid consumers of tailored dress shirts, they decided to capitalize on their knowledge of custom-made clothing and offer men a more convenient, affordable, hands-on alternative to visiting their neighborhood tailor. The result was Hong Kong based e-retail company ShirtsMyWay, which launched in February 2009 and boasts more than 7 trillion possible designs for men's dress shirts. Meet one of the hottest startup trends--mass customization. The internet is now host to countless companies selling custom-designed furniture, throw pillows, rugs, eyeglasses, T-shirts, shoes, handbags, computers, skateboards--you name it. Technology has obviously made reaching customers from the far corners of the globe possible. But how do mass customization companies make selling one-off products profitable? From a revenue standpoint, offering customers a seemingly infinite number of choices may seem counterintuitive. But those in the mass customization trenches say that in some ways, it's a more efficient way to run a retail business. "With traditional, non-personalized goods, you have to produce thousands in the factory and then sell them all," Crawfurd says. "What we do is on-demand production. We don't need to go out and buy thousands of meters of fabric. There's very little waste." The trick is finding that sweet spot between offering your customers enough options to keep them satisfied and not overwhelming your production system, says Dan Olszewski, director of the Weinert Center for Entrepreneurship at the Wisconsin School of Business. "From the customer standpoint, you want it to look like you have millions of unique products, even though you may only have a few different degrees of change for each," Olszewski says. ShirtsMyWay offers just 25 fabric choices. But factor in sleeve length, collar type, cuff type, pocket shape, stitching options, monograms and the like, and the design possibilities seem infinite. For decade-old web retailer Smart Furniture, based in Chattanooga, Tenn., mass-producing the individual components of the custom shelves, entertainment centers and other furniture the company sells is key. "We can adapt to unique customer needs as they change," says founder and chairman Stephen Culp. "It's like Legos for adults." Still, you don't want to throw your customer into option overload, says Jennifer Velarde, founder and president of Chicago-based custom handbag retailer 1154 LILL Studio, which also got its start 10 years ago. "You want to simplify your model, but you want to be unique," says Velarde, whose company trots out five to ten new handbag templates a year, with fabric and other customization options changing each season. Selling one-of-a-kind products is only half the equation. The other half is selling customers a creative experience that lets them fiddle with colors, patterns, textures, shapes and sizes online to see exactly what their masterpiece looks like before clicking the 'buy' button. "Our best customers are there because they love playing with fabrics," Velarde says. "It's about finding a concept that people are excited not just to purchase but to talk about with their friends." For this reason, having a superhero-strength website with user-friendly navigation is crucial. Ditto for top-notch quality control that ensures the right order ships to each customer. "We take a lot of complexities on the back end and we make it very simple for the consumer," says Culp. Culp likens his business model to a three-legged stool, equally reliant on design, technology and customer service. He takes answering customer questions so seriously that the half-dozen customer service agents he employs have design backgrounds. "You're not going to call us and feel like you're dealing with incompetence," he says. That's not to say customer service has to be a huge financial hit. As Olszewski points out, "The customer is investing time in creating the order that you would have otherwise had to do on your end. That's another cost savings." Slow, organic growth has been essential for these three custom retailers. "We started with one product line with a business model that can be a blockbuster and made sure we understood the ins and outs of it to the nth degree," Culp says of his Smart Shelves brand, which today accounts for 20 percent of his business. Rather than follow up his freshman effort with another original product line, seven years into the business Culp began recruiting high-end furniture makers like Herman Miller and Steelcase to sell custom versions of their products on his site. Today Smart Furniture features nine such brands. Velarde didn't start her business online, but at a street fair. From there, she moved to a storefront (today she has three) and hired sales reps to take handbags and fabric swatches to private parties in people's homes (she now has about 60 reps in 40 U.S. cities). It wasn't until her sixth year in business that she added a robust customization feature to her website, which today accounts for 20 percent of 1154 LILL Studio's business. But Velarde wouldn't have done it any other way. "The party model has definitely been a huge part of our growth," she says. And all that customer face time yields a goldmine of product feedback you can't always get online. 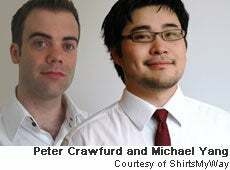 As for Crawfurd and Yang, although their profits have grown exponentially since hanging their shirt-making shingle and they'd like to launch other product lines eventually, they're not in any immediate rush. "We want to focus on doing one thing very well," says Crawfurd. "It's so tempting to add a few more variations," Culp says. "But each time you do, you complicate your business in multiple ways. You've got to strike the right balance."